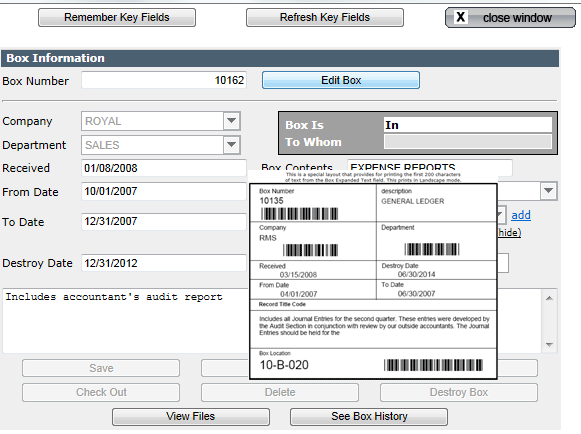 Record Management Software, Inc. offers integrated, stationary and portable bar code readers that are manufactured according to rigid specifications and offer the most inexpensive bar code reader setup. These readers yield a dramatically better read on marginal bar codes. Both models use a USB cable to connect the bar code reader to the PC. The use of this cable allows the keyboard to remain active and can be used at all times. This is a very compact unit not much larger than a TV Remote Control, with all the functions of the other portable models. 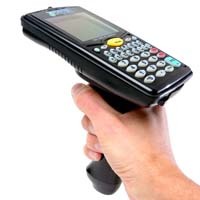 STATIONARY integrated Laser scanners read all types of bar codes instantly and will read a medium density bar code from 1 to 40 inches away. Dot matrix and high density bar codes are easily read too. Thus all Files and/or boxes must be Checked Out or Checked In at the station. If you need to process items away from the station, we suggest using the Portable model above.